It’s always a pleasure to travel around Spain and Portugal researching new destinations and revisiting our favourite places. Ever since we set up Totally Spain in the year 2000, we’ve been creating unique itineraries for our clients from our special finds. Here are some real gems from a recent trip to Central & Northern Portugal over Easter 2017. [And when you’ve read this, remember to check out our detailed travel guides to Central & Northern Portugal]. It’s hard to choose as this coastline is stunning but the 2.5kms of Praia da Claridade beach with its boardwalks, promenade and beachside bars in Figueira da Foz was pretty special. Make sure to try out the amazing ice-creams (which are more like edible sculptures) served at Gelateria San Remo! The fascinating artisan village of Cerdeira, one of the 27 villages on the Schist Villages route. Schist is a coarse-grained metamorphic rock that consists of layers of different minerals and can be split into thin irregular plates. In the Central region of Portugal, you can visit lots of these villages featuring houses constructed from schist. Cerdeira is just one of these and we really enjoyed its creative vibe. You’ll find lots of workshops here from painting and creative writing courses to nature trails and wood carving classes. 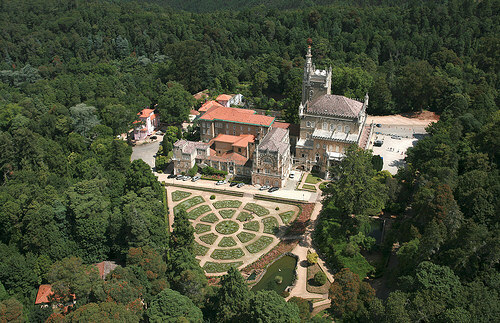 A real gem in Central Portugal, this 75-minute circular walk around the beautiful woodland and gardens of Buçaco Palace – too stunning for words! See how many of the 400 native species you can spot and relax at the five-star neo-Manueline palace which is now a hotel afterwards (if you’re boots aren’t too muddy!). The ancient city of Conimbriga is the largest Roman settlement in Portugal and is well worth visiting on any tour of central and northern Portugal. 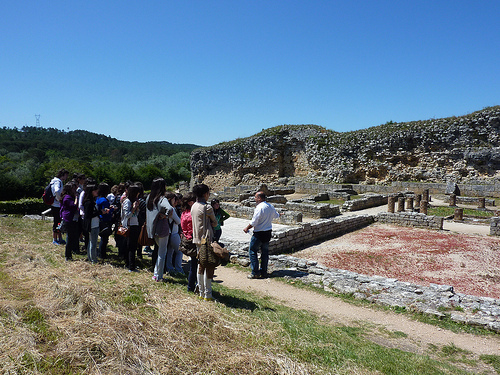 We are big fans of archaeology and the roman ruins at Conimbriga were high up on our list for this Central Portugal trip and we weren’t disappointed with what we found – Roman houses, mosaic floors, an amphitheatre, thermal baths, benches, tunnels – it’s really amazing how well this site is preserved. You’ll find a visitor’s centre and museum alongside the ruins to get some information about this site that was once a major city in Lusitania. 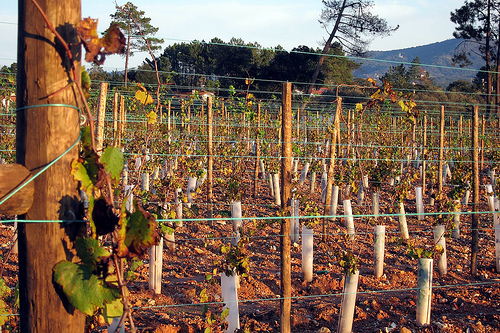 At Totally Spain we love wine-tourism and our clients always enjoy a scenic driving route through the vines. We had a great time driving through the extraordinarily pretty Bairrada Wine Region which is known for its ‘baga’ grape but actually produces an additional 8 red wine varieties – all of which are well-worth tasting. 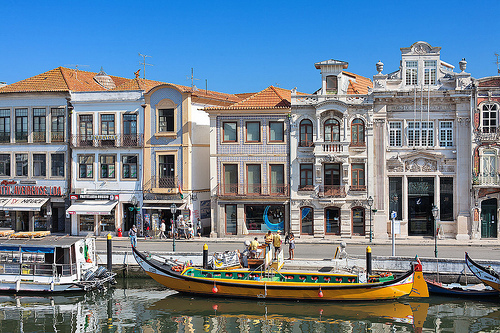 Every time we visit Aveiro on the Costa de la Plata or Silver Coast it seems to somehow look prettier than it did on the previous trip and we have to say that Aveiro and its canals really come to life in the spring. The perfect time to visit and take a boat ride in one of their gondola-like crafts known as moliceiros! If you love ceramic tiles, then the tiled houses in the old town will charm you and have you readily snapping away. 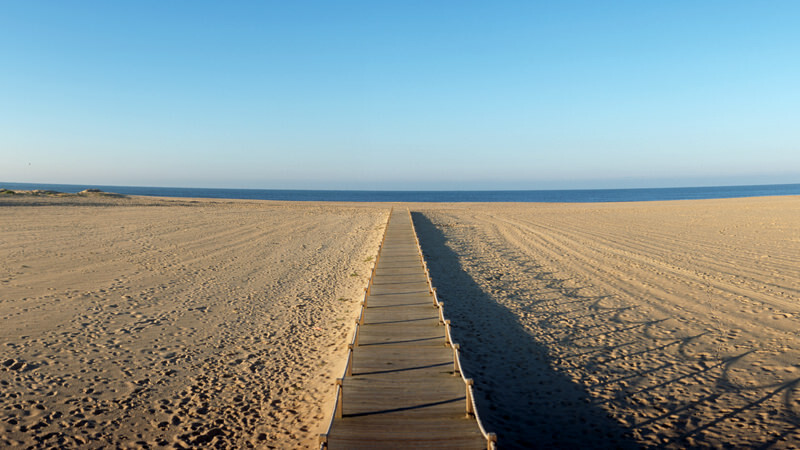 And the nearby beaches of the Costa de la Plata are some of the best in Central and Northern Portugal. Coimbra also dazzles when the sun shines. 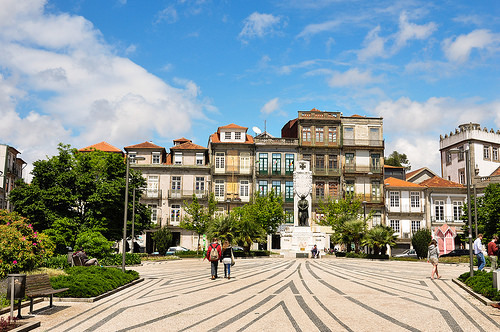 This city, once the capital of Portugal, boasts the oldest university in Portugal and some of the nicest squares and cafes too! We’ve been here in term time when the students are walking around in their gowns but this time it was student-free and was still every bit as good. It’s a steep town to walk in so comfy shoes are essential especially for walking up the atmospheric Rua Quebra Costas though there are plenty of nice places to enjoy a refreshment. Worth checking out the Fado Centre or Fado ao Centro on this street too where you can enjoy a performance of a unique kind of fado found in Coimbra. Leiria is one of the smaller cities in this area and is often visited after a trip to nearby Fatima. You couldn’t find two cities more different if you tried. 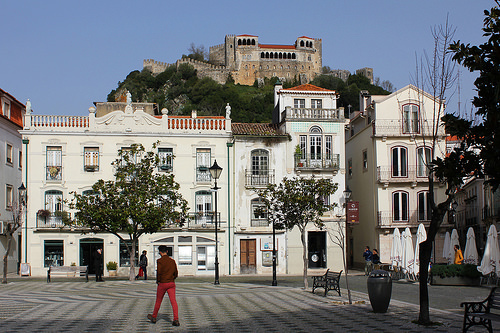 We really enjoyed Leiria with its grand castle that dates from 1135 overlooking the town’s inhabitants. And make sure to check out the buzzing Restaurante Mata Bicho a lively and popular lunch-time spot. How many terrific walks alongside the Foz do Douro did we clock up? We couldn’t stay away from it! 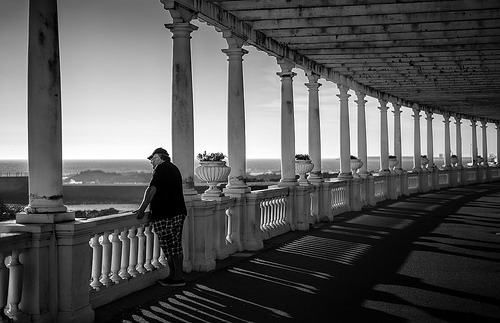 The views of the Atlantic are wonderful and this 1930s pergola really transports you back to a time when the well-heeled of Porto started constructing Art Nouveau summer houses in the area. 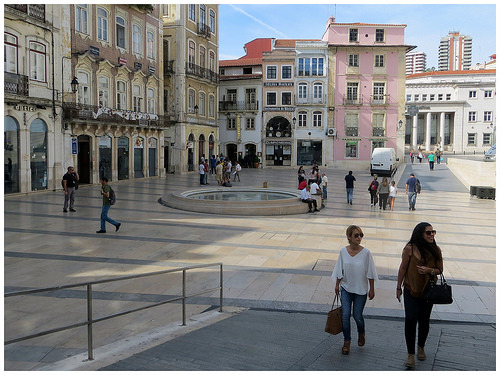 We recommend taking a taxi from Porto to Foz and then walking back in to town. Bike hire is also readily available and a popular way to enjoy this lovely route. 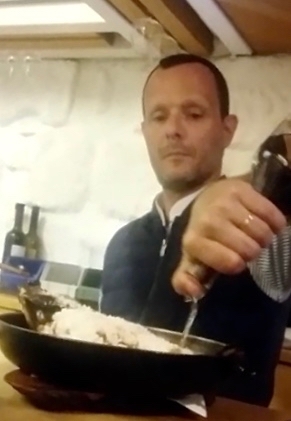 There are plenty of places to stop off for a bite to eat on the way. If you want to splash out, then the splendid Michelin star Restaurante Pedro Lemos is the place to go. We liked the informal (and very inexpensive) Restaurante Porto.Come on the same street as Pedro Lemos. Whenever we visit a city, we also seek out its food markets. 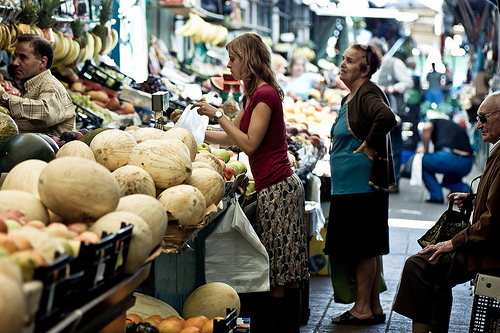 In Porto, the atmosphere of a true old market can be best experienced at the Bolhao Market. At the entrance, we came across a busker with a parrot on his head, playing a hand organ, creating a melody and a scene that would resonate with Tom Waits fans. The market is to be closed soon for restoration. We look forward to visiting it again and check whether it’s kept its atmosphere intact – fingers crossed! In direct contrast to Bolhau, aesthetically speaking, we really enjoyed the Saturday market at the slightly off-centre Mercado Porto Belo on the Praca de Carlos Alberto – in addition to lots of chill-out seating, you’ll find stands selling music, arts and crafts. We also like the curious new and second-hand shops surrounding that area and along the Rua de Cedofeita. If we had to pick just one meal, it would have to be the amazing dinner at the tiny 16-seater Taberna Dos Mercadores on the Rua Dos Mercadores in the Ribeira district Porto. A mouth-watering, flaming experience. Book and let us know how you get on! If you liked this post on Central & Northern Portugal, you may also like to read our other posts on Portugal. 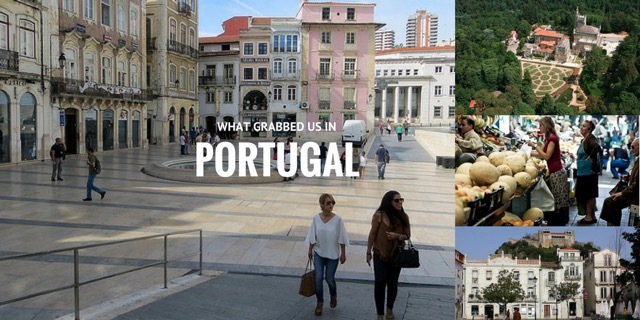 Posted in Getting Around, Portugal, Useful Information and tagged Aveiro, Bairrada, Bolhau Market, Buçaco Palace, Cerdeira, Coimbra, Conimbriga, Figueira da Foz, Foz do Douro, Leiria, Mercado Porto Belo, moliceiros, Porto, Ribeira, Schist.